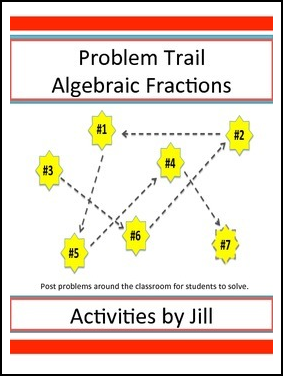 Problem trails are great because they get students up and moving around the room. They also encourage students to check their work carefully since an incorrect answer will eventually send them back to a problem they have already solved. Successfully completing a problem trail requires students who tend to work too quickly to slow down a bit. The activity consists of 8 problems that can be completed individually or in pairs. This problem trail is appropriate for a 40-50 minute class period. Objective: Students will simplify, multiply, and divide algebraic fractions. Identifying restrictions and factoring required. If you like this, check out my Multiplying & Dividing Algebraic Fractions Activity Cards! They work well with the problem trail! Problem Trail Algebraic Fractions by Activities by Jill is licensed under a Creative Commons Attribution-NonCommercial-NoDerivatives 4.0 International License.